Just How French Are French Fries? French fries are having a moment. They’ve been name checked as part of presidential policy. In England, a rat caused a nationwide stir when it ran up a man's leg in a pub to steal a french fry. And last month, McDonald’s' in Japan starting serving up “McChoco Potato,” a french fry/chocolate combination that looks absolutely unappealing. While this fried potato delicacy gets its name from after our French brethren, there's evidence that the name could be inaccurate. The French fry may actually not be French after all. Potato experts agree that the potato is a New World vegetable, originating in today’s Peru before making its way across the Atlantic to Europe. When Spanish explorers saw the Incas feasting on these starchy brown round objects, they were intrigued by the versatility of this new-found crop. Sending loads back to Europe, the Spanish began the potato revolution. The vegetable's main calling cards were its abundance, its heartiness and the simplicity with which it could be prepared. Potatoes are credited for saving France from famine in the 18th century (thanks in no small part to French Johnny Appleseed). With the potato’s ubiquity throughout Europe, it’s hard to pinpoint exactly when they started to be sliced and deep fried. There’s little doubt that the French did love their fried potatoes though, with street vendors at Paris’s Pont Neuf (the city’s oldest bridge) selling them by the bag load. This snack wasn't shaped like what we've come to know as a traditional French fry. They were more like chunks. It’s said that Thomas Jefferson loved this street treat so much that he introduced it to America, insisting that his chefs learn how to make them so the writer of our constitution could eat them at Monticello’s fancy banquets. France’s next-door neighbors, the Belgians still claim that they are the rightful originators of the dish. Calling them “frites,” and an outing to a local stand is considered a cultural tradition in Belgium. In 2014, the country petitioned UNESCO to make frites the official icon of Belgium’s cultural heritage. There’s even a national museum devoted to them. In other words, Belgians take this whole potato business very seriously. 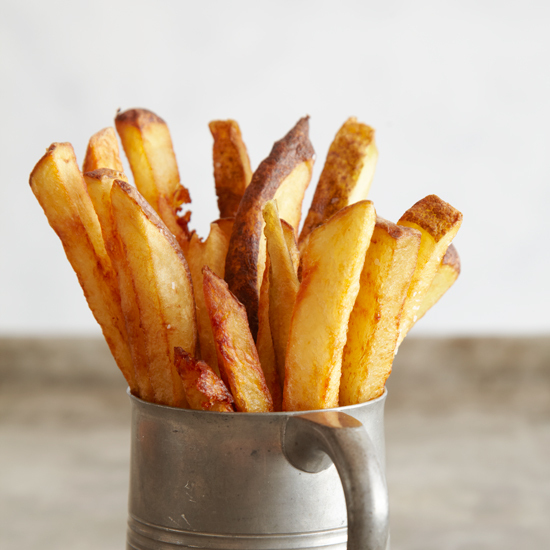 They also firmly believe that the frites were invented in Belgium in the early 17th century, perhaps up to a full century prior to France’s claim. The story goes that during Belgium’s harsh winters, locals turned to fried potatoes because their nearby rivers would freeze, preventing them from accessing their other food source - fish. In fact, as sort of a joke, legend has it that they would cut the potatoes into fish shapes before frying them. For hundreds of years, Belgium and France enjoyed their fried potatoes concurrently. But, according to the tale, it was an American intrusion that unwittingly handed deep fry glory to France. During World War I, American soldiers were marching through southern Belgium when they happened upon this delicious delicacy. In southern Belgium, a large portion of the populations speaks a variation on the French language called “Walloon.” This caused confusion among the Americans, who in a classic English misspeak, called the dish they were enjoying immensely “French fries.” Returning home, they brought the beloved food and the potentially wrong name with them. No matter the exact origins of the fry or if you call them French, frites or freedom, one thing is for sure - fries are delicious.